They are so lovely, Elizabeth. I love the way carnations last so long. 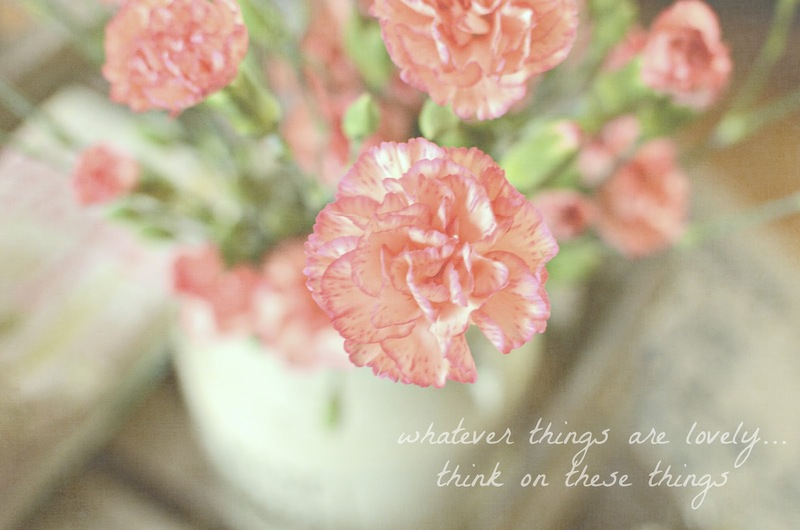 I love the long-lasting quality of mini carnations! You image is especially lovely. Beautifully shared! My sweet husband is not the sort to just randomly bring me flowers so early in our marriage he told me to include a few dollars in our grocery budget and buy them each week...practical romance :-) Regardless of where they come from I love having fresh flowers in the house and if you keep the water clean they will last for a while. So lovely and fresh...lovely verse. I really love the photo on your header! Love your perspective you did on your image, beautiful use of composition. The color is fantastic also. Beautiful. I love the composition of the image. The flowers forming a triangle with the main flower at a vertex in the middle of the image. And a diagonal direction from the upper left flower through the center flower leads your eye to the text. Nicely done.